Jessi Bloom, owner of Mill Creek's N.W. Bloom EcoLogical Landscapes, taught a class entitled, Sustainable Landscape Design on Wednesday evening at the Mill Creek City Hall. Bloom is a Certified Professional Horticulturalist and ISA Certified Arborist. The City of Mill Creek hosted the free sustainable gardening class as part of the Mill Creek Natural Yard Care Series sponsored by the Snohomish Conservation District. About fifteen Mill Creek residents learned how to work with factors in their yards such as light, soil, and water to design and plant healthy, nourished landscapes. Bloom discussed low-maintenance gardens, planting edibles, and strategies for growing a self-sufficient garden. Bloom outlined the basic steps of landscape design including choosing the right plants for a given space and provided detailed answers for questions she has been asked over the years. Jessi Bloom is an award-winning landscape designer whose work emphasizes ecological systems, sustainability, and self-sufficiency. 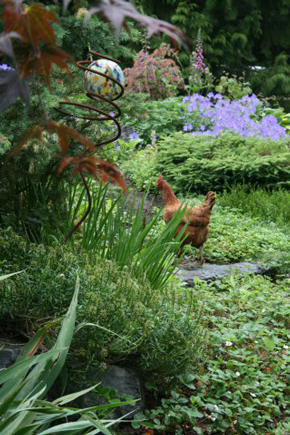 She is a Certified Professional Horticulturalist and Certified Arborist, as well as a long-time chicken owner with a free-ranging flock in her home garden. Bloom had autographed-copies of her recently published book, Free-Range Chicken Gardens, How to Create a Beautiful, Chicken Friendly Yard, available for sale. Her newest book is selling very well on Amazon. Bloom has been praised as an innovator in sustainable landscape design. Recognition for her work includes awards from the Washington State Department of Ecology, American Horticultural Society, Pacific Horticulture magazine, Sunset, 425 magazine, Washington State Nursery and Landscape Association, and the Northwest Flower and Garden Show, including gold medals and the People’s Choice award. Bloom won won a Grand Award from the Washington Association of Landscape Professionals in 2011 for her design of the Mill Creek Veterans Monument.